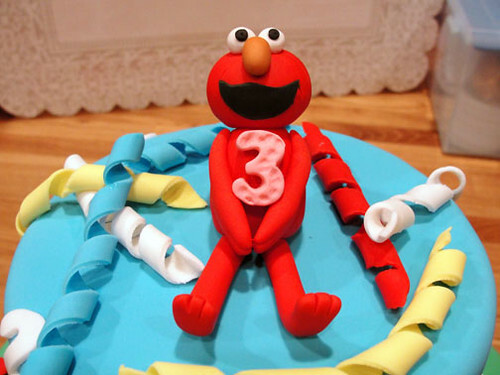 Sunny days for Sesame Street cakes! 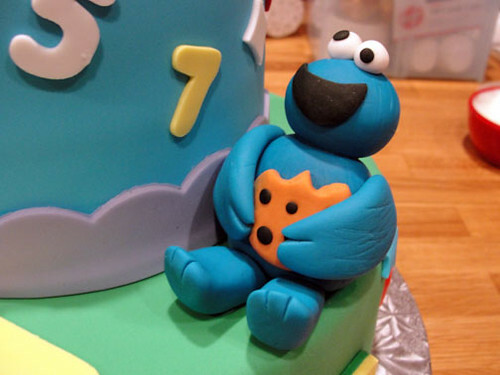 It seems as though that everyone's favorite characters are Elmo, Cookie Monster, or Big Bird! 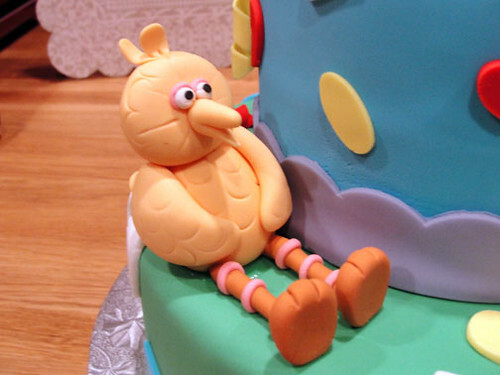 Being the sugar model fanatic that I am, I created sugar models of these lovable characters. Starting with the torsos of each one, I rolled out balls of 50/50 mixture of gumpaste and fondant. Each ball were rolled and shaped accordingly to create the limbs for each character. The heads were then shaped, using the body for sizing. I didn't want my sugar models to look like bobble heads. A toothpick is inserted into the torso as support for the heads. Remember to use gum glue! Brush it on lightly to hold everything together. I placed the sugar models aside to dry. Time to move onto the cakes! I started with a classic vanilla cake batter, and baked them into two 10", and two 6" layers for Alex. Oneida's was a bit different with a 10" of yellow cake, topped off with a 6" of chocolate goodness. after baking, I allowed these to cool completely before working with them. 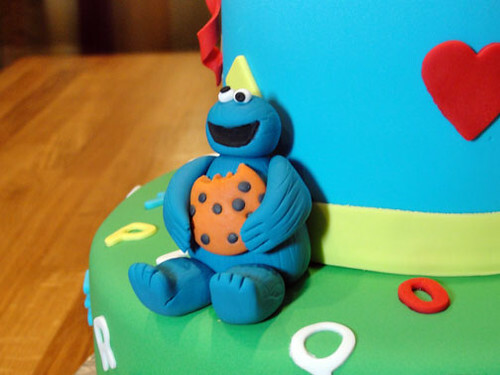 Applying icing to a warm cake will only leave you with a melting mess of sugar and butter. 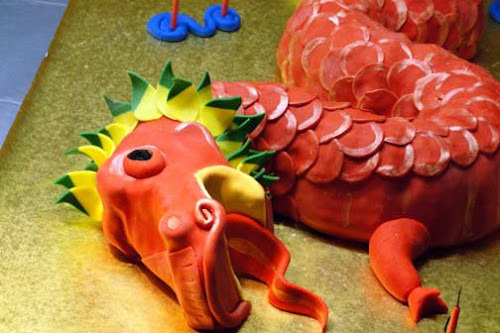 The cakes were then torted and filled. 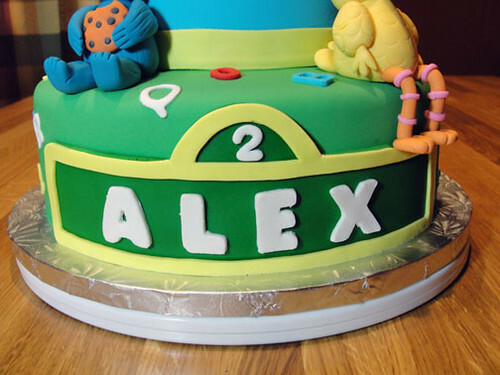 For Alex's cake, I filled it with raspberry puree. It's a perfect balance of sweet and tartness! 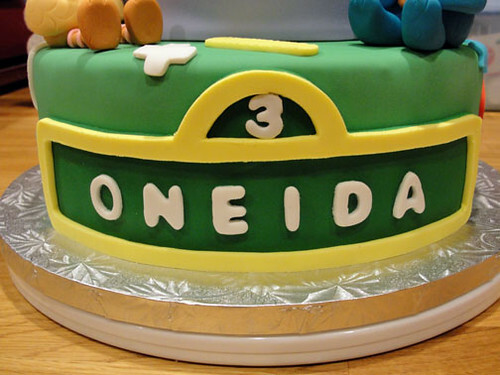 Oneida's was filled with buttercream in the bottom layer, and chocolate bavarian cream on top. I then cover the stacked layers with a food safe bag, and left them on the counter for a few hours. This gives the torted layers a chance to settle, and help eliminate that ugly bulge that can happen on the sides of a cake. The cakes are then lightly crumb coated with buttercream, and then covered with a thin blanket of fondant. The 6" cake is then stacked onto the 10" cake with the support of dowel rods. 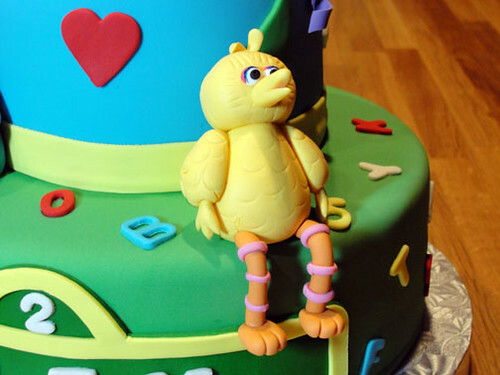 Fondant elements were cut out and attached to the cake with a touch of water brushed onto the backside. 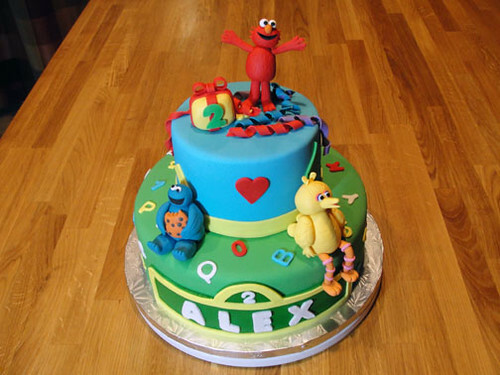 Each one received the a customized Sesame Street sign boasting the names of each birthday girl. 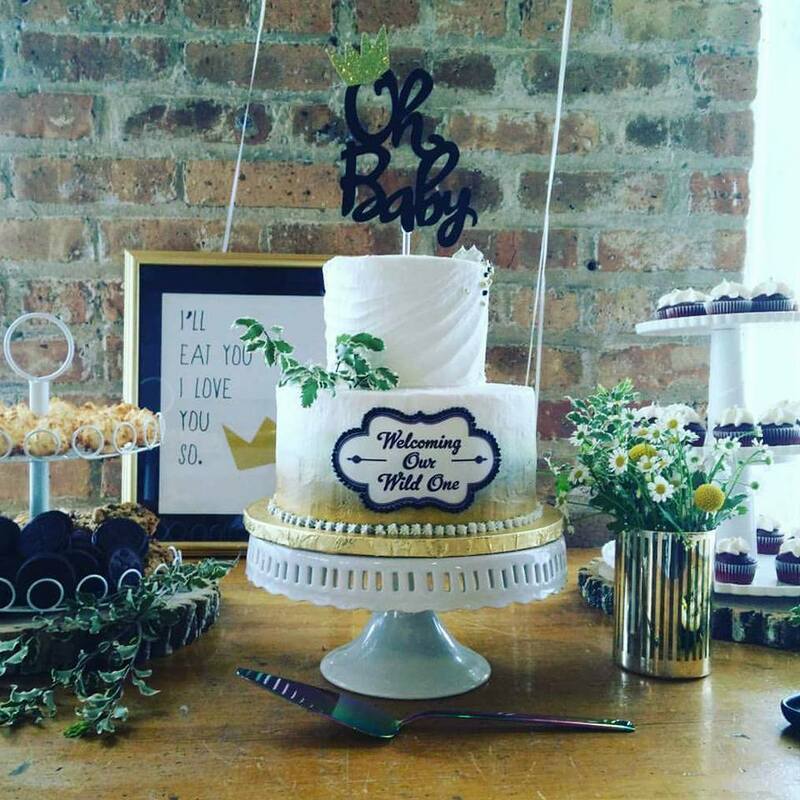 For a celebratory touch, I created streamers by wrapping thin strips of fondant around dowel rods and allowed them dry to hold their curly fun shape. 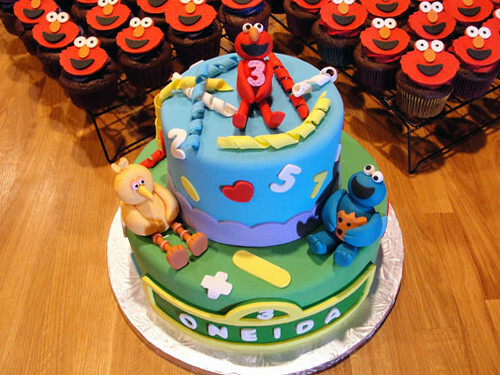 Oneida's Sesame street fun continued with rich chocolate cupcakes topped of with buttercream and a fondant Elmo! 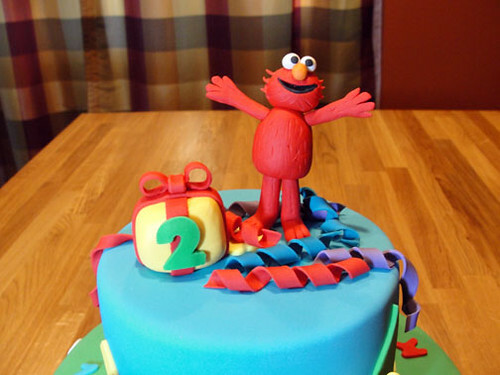 The Elmo toppers were cut out of fondant and assembled a day ahead. This allowed for ample drying time. The cupcakes were baked and allowed to cool before I piped on red and purple buttercream. 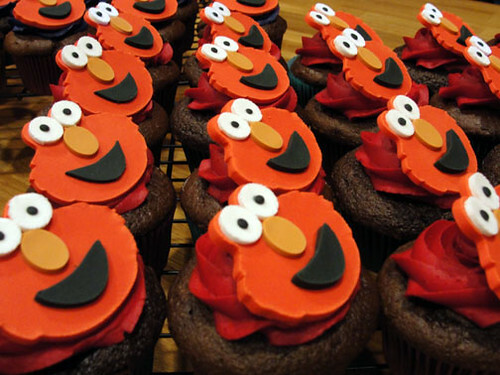 The Elmo toppers were then placed on top of each cupcake at an angle. I hope that these treats brought some sunny days into the world of the birthday girls! Alex and Oneida, I hope you had as much fun as I did!